There are ten stories here including one readers have waited ten long years for: in new novel-la The Border State Rowe revisits the world of his much-lauded story The Voluntary State. Competitive cyclists twins Michael and Maggie have trained all their lives to race internationally. One thing holds them back: their mother who years before crossed the border ... into Tennessee. "Rowe's stories are the kind of thing you want on a cold, winter's night when the fire starts burning low. Terrific." 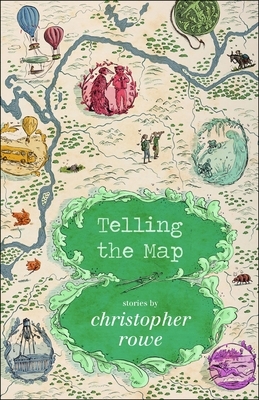 Christopher Rowe's stories have been finalists for the Hugo, Nebula, World Fantasy, and Theodore Sturgeon awards, frequently reprinted, translated into a half-dozen languages, praised by the New York Times Book Review, and long listed in the Best American Short Stories. He holds an MFA from the Bluegrass Writer's Studio. Rowe and his wife Gwenda Bond co-write the Supernormal Sleuthing Series for children, and reside in a hundred-year-old house in Lexington, Kentucky. Christopher Rowe: Christopher Rowe has published a couple of dozen short stories, and been a finalist for the Hugo, Nebula, World Fantasy, and Theodore Sturgeon Awards. His work has been frequently reprinted, translated into a half-dozen languages around the world, praised by the New York Times Book Review, and long listed in the Best American Short Stories. He holds an MFA from the Bluegrass Writer's Studio. Rowe and his wife Gwenda Bond co-write the Supernormal Sleuthing Series for children, and reside in a hundred-year-old house in Lexington, Kentucky.